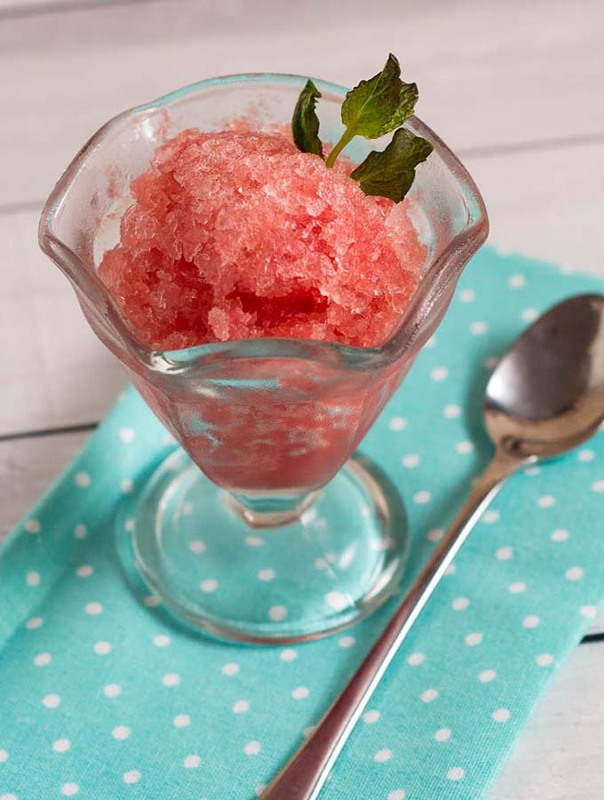 Granita is a Sicilian dessert made from crushed ice and flavoring. 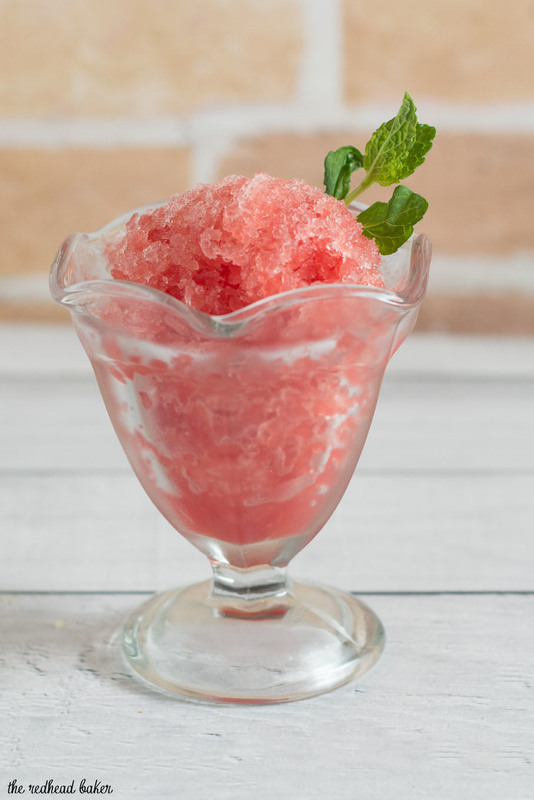 This watermelon mint granita is light and refreshing, perfect for a summer day! 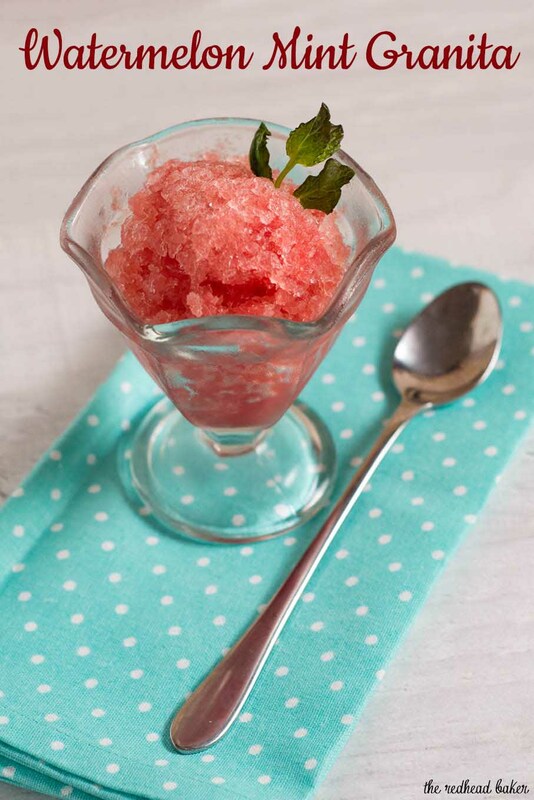 Have you ever wanted to make a homemade frozen treat, but you don’t have an ice cream maker? Try a granita! 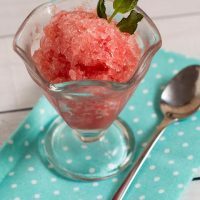 It’s similar in flavor to a sorbet, and similar in texture to shaved ice (aka Italian ice or Philly water ice). A granita is very easy to make. You combine water with fruit syrup, then freeze it. At intervals during the freezing process, you scrape the mixture with a fork to create to flake it. 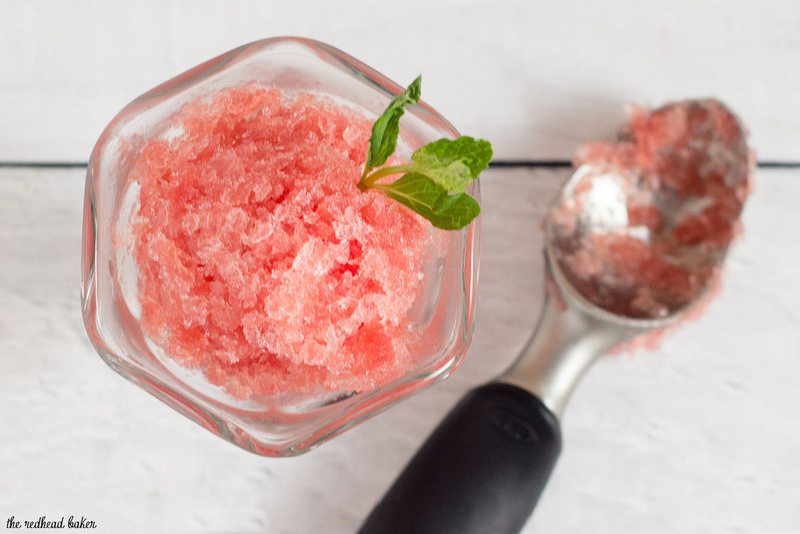 This watermelon mint granita is an exceptionally refreshing summer treat. The watermelon turns the ice a beautiful shade of pink, and mint provides a refreshing complimentary flavor. If you need to watch your fat intake, this is a delicious dessert option, because it’s fat-free! It’s also very low-calorie at just 56 calories per half-cup serving. 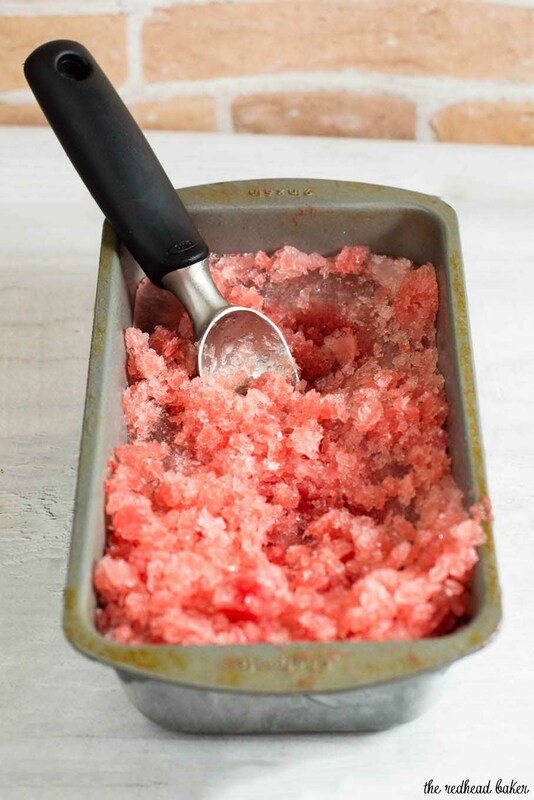 You can make a granita from just about any fruit, as long as you can make a syrup from it. Though fruit flavors are traditional, you can make non-fruity flavors as well. When I worked in a restaurant many years ago, we served a coffee granita. In some areas, granita is served in an ice cream dish garnished with almonds. In other areas, it’s served with a yeast pastry similar to brioche. In yet other areas, it’s served as a drink in a cup with a straw. In a small saucepan, combine water and sugar. Heat over low flame until the sugar dissolves. Add the mint sprig to the saucepan. Increase heat to bring mixture a boil. Cook at a boil for 5 minutes. Remove from the heat and let stand to cool. Puree the watermelon (in batches, if necessary) in a blender. Pour through a fine-mesh sieve into a large bowl, pressing on the solids to extract as much liquid as possible. Pour the mint syrup through the sieve into the watermelon juice. Squeeze the lime juice through the sieve into the watermelon mixture. Discard any solids in the sieve, and stir the mixture in the bowl. Pour into a 9x3 loaf pan, and place in the freezer for at least 4 hours. Disclaimer: nutrition information estimated with MyFitnessPal Recipe Calculator. For complete nutrition information, consult a registered dietitian.